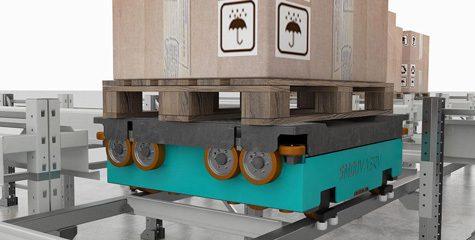 Moving beyond the boundaries of intra-logistic automation. The automatic warehouse within everyone’s means. New patented design for standard racking. Increased performance using the latest, advanced technology. The highest level of reliability in challenging environments. Seamless interface with dynamic storage systems. The uniqueness of Smoov ASRV Generation 2 lies in its innovation system of wheels; 16 in total, with a group of independent wheels for each direction of travel, arranged on two different levels. To activate movement in the direction required, the wheels move up and down vertically. An unbeatable combination of stability, performance and control without the need for strict requirements in terms of tolerance. Interface with gravity roller conveyors. With Smoov Generation 2 we have surpassed ourselves. Group of independent wheels for each direction positioned on two levels with a total of 16 wheels. 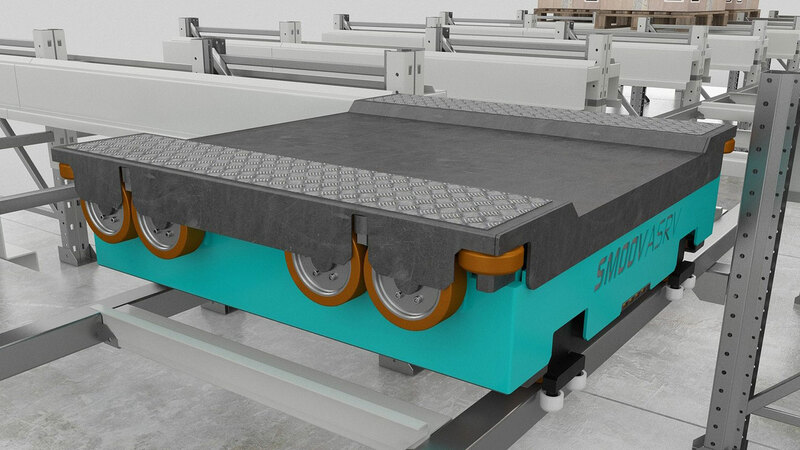 Innovative system enabling interface with gravity rollers conveyors. No possibility to interface with gravity roller conveyors. Battery replacement system without the necessity of lifting the vehicle. More advanced yet simplified dynamic control of the vehicle. 42 Ah Lead AGM batteries. More sophisticated system for control of the system. More powerful and reliable sensors. Not equipped with RFID capacity. Low sensitivity of the racking to manufacturing and assembly tolerances. Easier and more reliable mechanical guidance of the vehicle in all conditions. 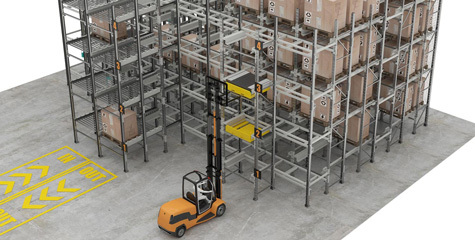 High sensitivity of the racking to manufacturing and assembly tolerances. Sophisticated electronic guidance of the vehicles along rails. 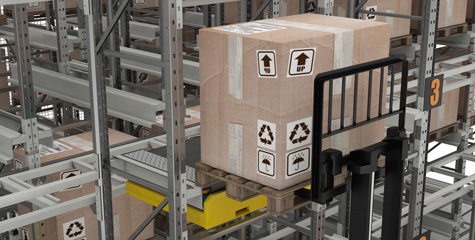 Standard racking: structural elements of a drive-in warehouse (eg pallet racking profiles). 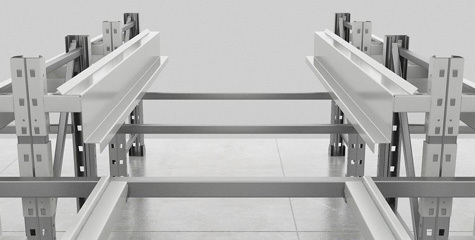 Specific racking from pallet racking profiles to the system of rails. 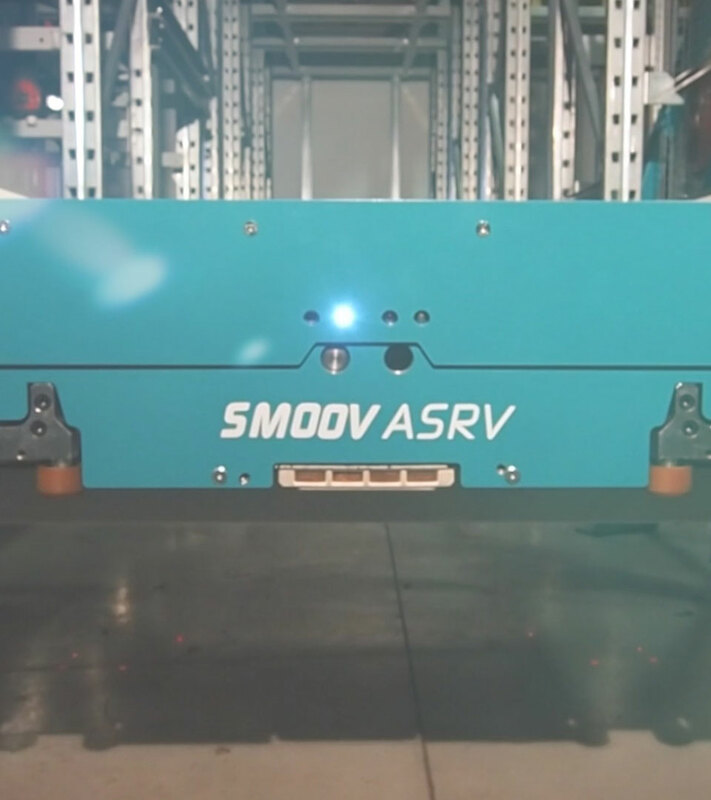 Are you interested in Smoov ASRV G.2 for your automation projects? We can provide you with our international patent. ASRV, THE NEW FORMULA FOR INTRALOGISTIC AUTOMATION. Looking for more information on Smoov ASRV Generation 2? Fill in the form below and you will be contacted by a member of our staff. I declare that I have read the privacy statement and the purposes for which data is collected on this form .